Sample improvised lines, turnarounds, comping patterns, and much more are provided with standard notation, tab and diagrams in this easy to read and understand wall chart. The basics and essentials of playing jazz guitar are compiled in one chart for aspiring jazz guitarists to learn from each day. Pick a lick a day (or week) and guitarists will be playing authentic jazz ideas in no time at all. 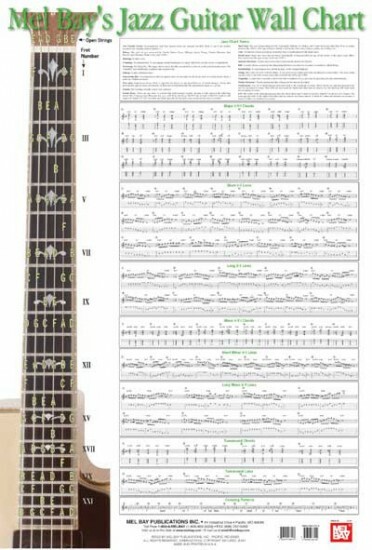 A stunning photo of a beautiful archtop guitar makes this chart functional as well as beautiful for hanging where guitarists practice.